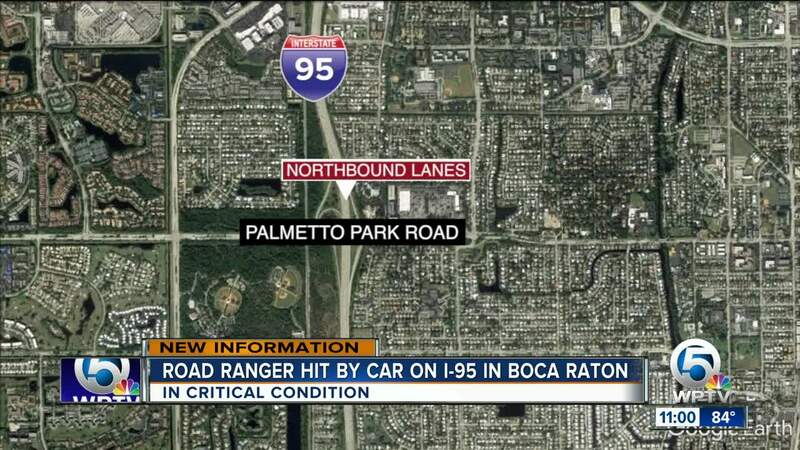 UPDATE: An FDOT road ranger remains in the hospital after a BMW driver hit him alongside I-95 near the Palmetto Park Road exit at 10:20 p.m. Wednesday. His son said he suffered from several fractures and severe bleeding. He's in a sedative state at the hospital. His son said he's been a road ranger for two years but has never been in a crash like this. "Every second you’re standing on the side of the road, you’re putting your life in jeopardy," said Cory Dominguez, of Priority Towing. Tow truck drivers in Palm Beach County say it's a risky job working alongside the tight shoulders on highways and roads around the area. “I got scared and pulled myself underneath and they swiped the side of the truck I was underneath," Cory Dominguez said. “I had to jump between my tow truck and the car. It must’ve been maybe three inches away from me," said Trevis Lewis, of Tows R Us. They say they've encountered several close calls because many drivers don't obey the 'Move Over' Law. "Maybe out of 100 cars, maybe 20 cars go around," Lee Dominguez said. 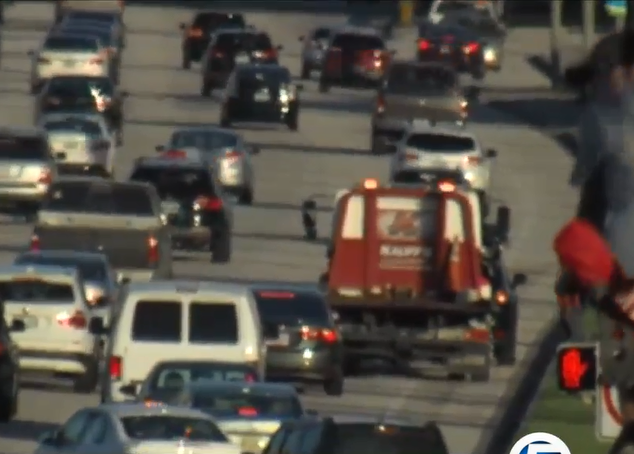 The law has been on the books for more than 10 years here in Florida, requiring drivers to move a lane over for emergency vehicles or, if they're unable to do that, slow down 20 miles per hour under the speed limit. “We leave our house every morning and we don’t know if we’re going to come back," Lee Dominguez said. You can receive a citation for not moving over, which can cost $166 in Palm Beach County and can also add points to your license. “I’ve got five boys at home, so at the end of the day I definitely want to go home and see my kids," Trevis Lewis said. 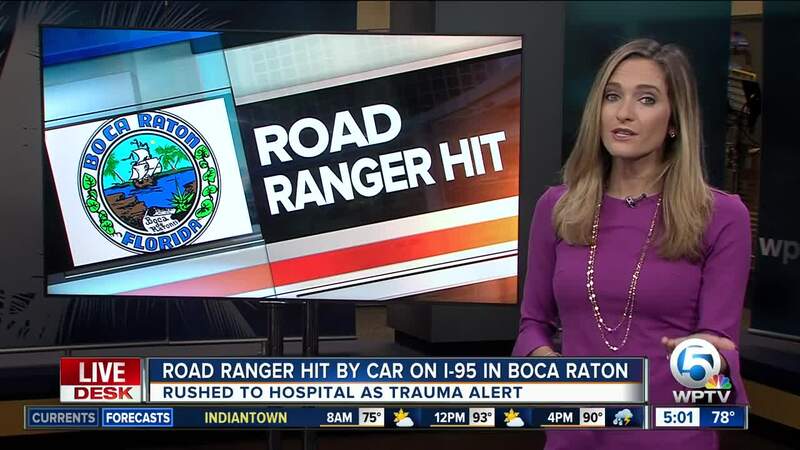 A Road Ranger is in critical condition after being struck by a car along Interstate 95 Wednesday night in Boca Raton. Florida Highway Patrol said a 29-year-old Delray Beach man was driving a BMW 528i in the middle lane of northbound on I-95 at about 10:20 p.m. 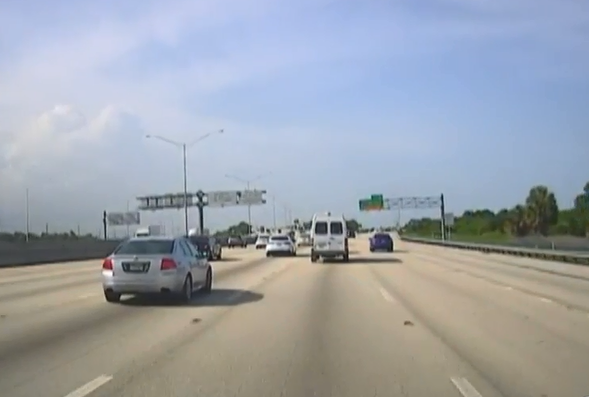 The Road Ranger, Michael Weber 57, of Lake Worth was on the east shoulder of northbound I-95. The driver of the BMW said he was forced out of his lane by another driver as they approached a work zone lane closure. The driver said he saw the Road Ranger's vehicle with its lights on in the road and attempted to avoid striking the Road Ranger's vehicle. The BMW driver swerved onto the east shoulder of northbound I-95, striking Weber. Weber is hospitalized at Delray Medical Center. The driver of the BMW was not hurt. The Florida Highway Patrol report says charges are pending.